If you really want to put a smile on TheHusband's dial, there are a few things you can do. And if Chinese takeout is your chosen bribery tactic smile generator, there is one dish that will warm TheHusband's heart above any other. Chow Mein. Whether it's beef, chicken or pork is irrelevant, the thing that's non-negotiable is that unmistakably umami sauce coating the noodles. There isn't even a lick of glamour about a big bowl of greasy chow mein but this doesn't faze him. In fact, he is of the opinion that more is more. More noodles? Bring it. In fact, don't try to ply him with anything but the "large" chow mein. You'd be wasting your time. So it was only natural that I had to attempt this classic at home. After all, I couldn't allow a middle-aged Chinese man to hold the keys to TheHusband's heart, now could I? And so I turned to my trusty friend google and gathered up the necessary ingredients. Luckily for me chow mein could not be easier to make. As with all stir fries, the key lies in prepping your ingredients ahead of time, so take a few minutes beforehand to slice your protein of choice and chop up your veggies. Briefly fry it, then cook your noodles in the oh-so-salty mixture of soy and oyster sauce, add back your fried meat and veggies, give it a few stirs and sit back while your beloved slurps up the goodness. Smile generator? You can say that again. 1. Soak noodles in boiling water for 2 - 3 minutes to soften slightly. Drain and set aside. 2. Meanwhile, heat oil in a wok and fry beef strips in batches until browned. Remove meat from wok. 3. Add more oil to the wok, then add carrots and stirfry for 1 - 2 minutes before adding bell pepper. Stir fry another 2 minutes or until tender crisp, then add spring onions and bean sprouts and fry for another 30 seconds. Remove and set aside. 4. Add about a teaspoon of oil to the wok, then add garlic, frying briefly until fragrant, before adding oyster sauce, soy sauce and water. Add noodles to the sauce, stirring to coat, then lower heat and cook, stirring every so often until noodles are almost cooked through. This will take about 5 - 6 minutes. Add more water if necessary to stop noodles from sticking to the wok. 5. 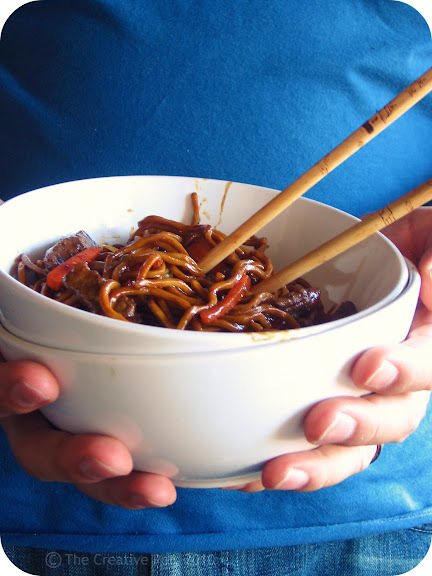 Return beef and vegetables to the wok, stirring to mix with the noodles and distribute the sauce evenly. Heat through, then serve immediately. Weeeeelll TheHusband would go crazy over lasagna too! Brilliant, we were planning on having a chinese meal tonight. I already have some char siu pork in freezer, plus some crispy beef. Last night I bought some lovely beef tenderloin steaks and was thing what to do with them. Thanks, we will now have beef chow mein with crispy shredded beef and special rice with some pieces of char siu added. Pop over to my blog & check out my recipes for the char siu & crispy beef. Whoa - this looks amazing and better than any take out chow mein I have ever seen. Wish I had a bit bowl of it right now. Ah so chow mein is the way to a man's heart! And to think, all this time I thought it was lasagna! This looks delicious. I'm pretty sure it might be the way to my heart as well. Love the pics and love the Chow Mein!! Thanks Nina! See what I meant about it being very similar to your bread pic? Obviously great minds think alike. My first job I worked for a Chinese couple. Almost every friday she would order pork chow mein with extra chillies and ginger for us. Okay! I'm buying Beef Chow Mein for supper tonight! Marisa, are you available for hire? I'd like to hire you every day when you prepare for another blog post please! I love the way you have with words. Your photography surpasses all the other blogs out there! Around here we add watch an American football game with him. Ha! This meal would work too. It looks so great! yummy this looks dark and delicious! curious what cut of beef you opted for here. looks fantastic! Thanks Tandy! Your kind words mean a lot. Wow I absolutely ADORE your blog! I strive to cook as tactfully as you! 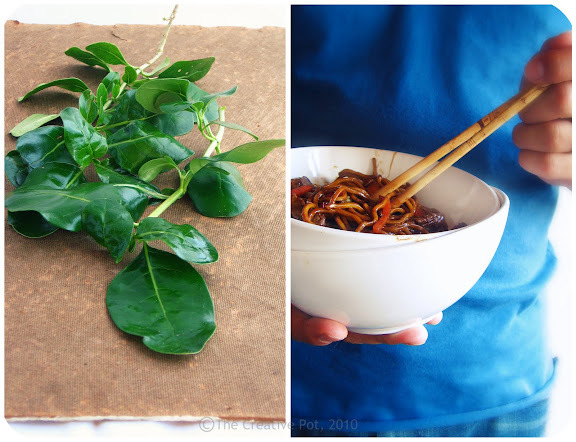 Great photos, great recipes, great blog! 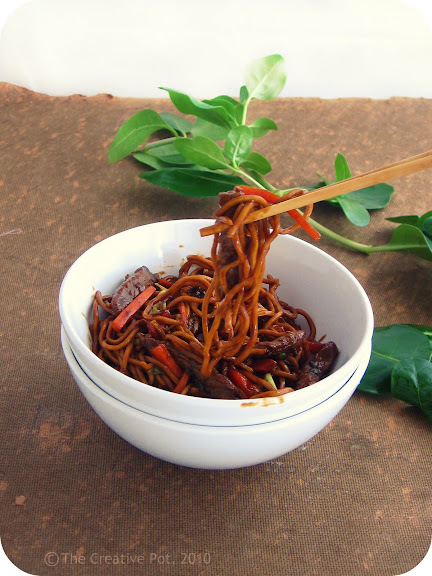 Chow Mein is my fail safe meal that I cook for me and my husband whenever we don't have a lot of time but want to feel healthy.